In 2016, Container Management magazine, a British global leader specialized in ports, navigation, maritime transportation and container handling, issued a report that ranked King Abdullah Port by far the fastest growing of any in the publication’s global list of top 120 ports. Additionally, King Abdullah Port was ranked 98th in a list of the 100 largest ports worldwide in 2017, after only three years of operation. King Abdullah Port is considered the latest infrastructure megaproject in the Middle East. It was built according to state-of-the-art specifications and world-class standards to cope with the Kingdom’s economic and commercial growth in the coming decades. The port was able to achieve rapid success and incredible progress in its operations in just a few years. Its success was based on several elements, the most important of which was the establishment of the Specialized Marine Services (SMS), a joint venture company established in 2013 between the Ports Development Company (PDC), which is the private sector owner and developer of King Abdullah Port, and the National Port Services Company Ltd.
SMS is the primary supplier of marine services, such as marine guidance, in King Abdullah Port. Its team includes highly qualified and skilled maritime guides with vast experience in dealing with the largest international vessels, most of which have visited the King Abdullah Port. All guides hired to work in the marine services department are ambitious Saudi youth who undergo periodic training in accordance with the highest international standards. In addition to their continual professional development on the job, they also proudly hold a record that is 100% accident free. In the field of towage services, SMS offers its services to all vessels in King Abdullah Port, while the multi-purpose fleet of tugboats provides the necessary around-the-clock support for vessel movement within the port. 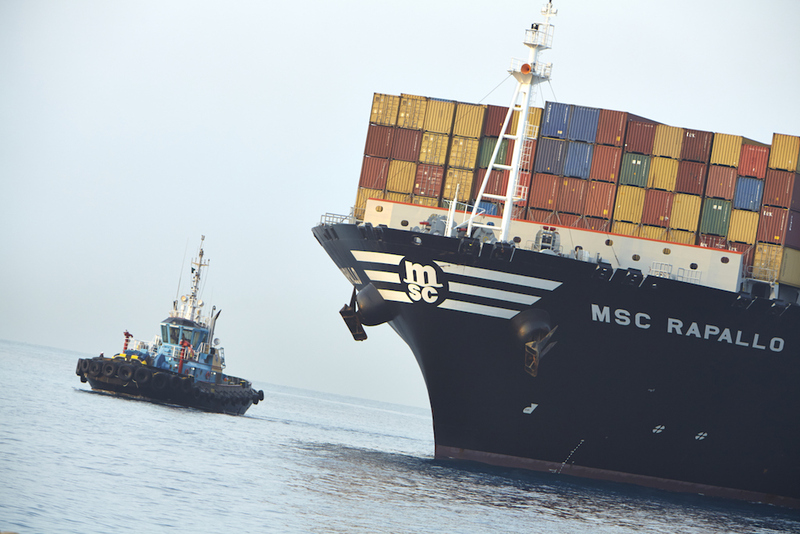 In addition, the company provides various services to Red Sea coast marine operations that work on maintaining the status of this sea corridor, which is classified as one of the most important corridors worldwide, according to experts. In addition to port operations, tugboats offer rescue and firefighting services to vessels both by the coast or sailing across the Red Sea. In 2016, the company provided handling and towage services to 1,460 vessels, and this number is expected to rise by 30% by the end of 2017. SMS is managed by a team of qualified Saudi officials and features the most advanced capabilities and technologies in the region. The company houses a fleet of four ASD tugboats with a towing capacity ranging from 47 to 85 tons (Dolphin-1, Dolphin-2, Wahoo-1 and Marlin-1), as well as a pilot boat (Barracuda-1). The fleet is one of the best in the region, and all units are registered in the Ministry of Transport and hold the Saudi flag. A team of trained and qualified individuals carries out underwater inspection using the latest equipment to provide inspection and diagnostic services, as well as maintenance and consulting services. The latter is in addition to the refueling services that will be made available in the near future. A vitally important part of King Abdullah Economic City and its Industrial Valley, King Abdullah Port is a key contributor to the national development plan and Vision 2030, a road map for Saudi Arabia to go far beyond oil dependency through diverse catalyst projects deemed to advance the Kingdom’s financial position and economic status. Strategically located on the Red Sea coast, King Abdullah Port contributes to enhancing the commercial status of the region, as it is located directly on the maritime shipping route linking Asia and Europe. Thus, the port is able to decrease east-to-west shipping times by five to seven days, which is a strategic advantage in light of the increasing economic importance of both China and India. In addition, the port is in close proximity to the Kingdom’s industrial and residential centers, and continues its development operations in order to increase and accelerate shipping efficiency.